Market traders contribute over £5.9bn to the UK economy. This sector employs over 24,500 people and has 32,000 businesses that trade at markets, fairs, events and online. In this article, we explain what insurance market traders and stallholders in the UK need and review market trader insurance companies. What insurance does a market trader need? How much does market trader insurance cost? How do I get market trader insurance? Public liability insurance is not a legal requirement but it’s well worth considering. It’s the core cover most market traders look for when they’re searching for insurance. Most market organisers and street markets will require you have a minimum level of public liability insurance to be able to trade. Requirements for this cover differ depending on the market. We recommend you contact your local market authority to see if they have a minimum level you’ll need to have. Public liability insurance is designed to protect you against claims of personal injury or property damage that a third party suffers because of your business activities. Find out more about the cost of average cost of liability insurance. Product liability insurance can be important cover if, for example, you sell home-made food. Insurance can cover you if a customer contracts food poisoning and seeks compensation. You should check with your insurer if you are selling products manufactured by another business. If you are selling food or drink products on your stall, you must register with your local authority. The authority will inspect your stall and tell what certificates or insurance you need to have in place. Employer’s liability insurance is a legal requirement in the UK if you have staff who help with running your business (even if they are unpaid volunteers), either on your stall or in a support capacity. It covers you for legal claims made against you by your employees. Stock insurance can protect you against damage to your goods or to your stall if they are damaged by a fire or water. It can offer cover against theft but it’s likely to only pay out for claims if the items were locked somewhere. You may be able to get insurance against the theft of cash but, again, security restrictions will apply. Van, commercial vehicle and goods in transit insurance can cover your van or other transport you use for your business and any items you take to and from the market. These may already be covered by an existing policy, but it is essential to check the extent and the scope of cover and to supplement your protection where necessary. Check out our guide to the best van insurance. It’s worth noting that not all business insurers offer van insurance so you may need to find a separate policy. Loss of income (business interruption) insurance covers the loss of income a business may experience following an unexpected event - such as a fire. Both the indirect loss of business and your revenue can be protected by the cover. Many trade bodies offer complimentary liability insurance to their members. With some, the cover you may get can be rather basic, coupled with a lower yearly membership charge, whereas others may be able to provide a more comprehensive policy but at a higher membership fee. Three popular trade bodies for market traders and stallholders are the National Market Traders Federation (NMTF), the Stallholder Club and the specialist market trader insurance broker The Combined Market Traders Insurance Association (CMTIA). The National Market Traders Federation is a trade association for market and street traders. They offer their members complimentary small business insurance that’s underwritten by Aviva. As a trade body and not an insurance broker, the NMTF is not regulated by the FCA. Its cover offers up to £10m for public and product liability, £10m for products liability and £10m for employer’s liability. Their liability cover has no excess and is valid for a wide range of locations, including anywhere within the EU. They have an extended definition of market trader, which means that you can work from a vast variety of places, eg market, hospital, pier, exhibitions, kiosks, etc but as long as you’re working from a stall, not a shop, you’ll be covered. In addition to settling legal expenses (in defending health and safety prosecutions), their employers’ liability cover will pay out to cover expenses you incur due to having to attend court - £500 a day for you, and £250 for an employee. The combined product and liability cover will cover legal expenses, expenses incurred due to having to attend a court hearing, employees’ and visitor’s personal belongings, personal liability cover for employees and directors while abroad on business of the policyholder. Furthermore, if you’re a trader at farmer’s markets and use a plot of land to grow the produce for your stall, your insurance will pay out to cover any liability claims arising from that. The list of exclusions includes, but is not limited to, limited cover for claims arising from terrorist action (£5m), pollution, asbestos-related injuries, any objects that are, or have been repurposed as, any type of weapons, invasive cosmetic procedures (except for ear piercing) and pharmaceuticals. E-cigarettes and related products are excluded from the cover, but traders who sell can still be insured by the NMFT, just not for product liability. As a member, you can also get help with appeals and HMRC investigations (including VAT disputes). Membership starts from £122 a year. CMTIA is a specialist market trader insurance broker, regulated by the FCA. CMTIA's insurance is underwritten by AXA. They insure sole traders that work on farmer markets, general markets, craft stalls, festivals and events. CMTIA’s market trader insurance will cover up to £5m of public liability expenses for £57 and you can choose to add employers’ liability for up to £10m for the additional charge of £34. Employer’s liability cover is only available if purchased alongside public liability. The CMTIA will not cover any moving vehicles, unless parked on a licenced pitch, so if you’re an ice-cream truck vendor you may not be fully covered. They do not cover beauty treatments such as eyebrow threading, waxing, nail technicians, body tanning or hair-styling. A common exclusion to business liability insurance that CMTIA adhere to is cover for invasive procedures, such as tattoos and piercings. CMTIA will not cover you for employers’ liability if you’re employees annual wage exceeds £75,0000. Your cover will also briefly extend to foreign work, as long as you're settled and primarily active in the UK. CMTIA's list of products they cannot provide cover for includes, fireworks, vital motor vehicle parts, second-hand electrics and homemade cosmetics. The Stallholder Club’s complimentary liability insurance offers up to £5m of cover for public liability. The insurance offered by the Stallholder Club does not cover claims arising from employee injuries or employee-related legal expenses. If you have employees, you are legally obliged to have employers’ insurance, so you would have to make sure to take out an additional policy. The policy will only cover your usual business activities, meaning that if you’re participating in an event or exhibition you will not be covered. Members also get free legal assistance. They can contact the legal team stallholder club works with from the organisation’s website in the section ‘legal assistance’. A one-day membership costs £18 and an annual membership is £59.50. Every market trader or stallholder’s business is unique, you might pay more or less depending on the insurance options you choose and the level of cover you require. Your price may be higher if you have made claims on a previous market traders insurance policy, or if legal action has been taken against your business in the past. You should always declare this information, if you don’t it might invalidate your policy if it comes to light. 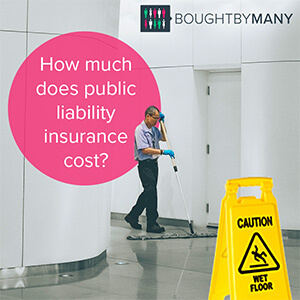 We researched the average cost of liability insurance for businesses here. It features tips on how to get cheap cover. How do I get insurance for a market trader business? NMTF Ltd is a trade association for market and street traders, events retailers and mobile caterers in the UK. Anyone over 16 who is a permanent UK resident can join the NMTF. NMTF membership includes access to public, product and employer’s liability protection, which is underwritten by Aviva. This protection has no excess and is valid for any number of days, on any number of stalls, on any market, festival, fair, show and/or street trading pitch, anywhere in the EU. Joining the NMTF entitles members to discounted prices on liability insurances. The membership gives up to £10m of cover for public liability, £10m for products liability and £10m for employer’s liability. Membership also provides commercial legal protection for appeals and HMRC investigations (including VAT disputes). The benefits of joining the NMTF are that you can get advice about how to set up and run your business and get liability insurance with good cover levels. However, it does not offer other kinds of cover like stock or van insurance so some people may find it more convenient to get all their policies as part of a business insurance package. Simply Business has a large panel of business insurance providers; if you enter your details it will return quotes from several companies to help you compare prices and cover. We got a quote and saw prices from Finsbury Insurance Services, Maltings Insurance, Lexicon and Covea. The cheapest quote was £70.35 per year from Finsbury Insurance Services. Our quote was based on a market trader who needs £5m public and products liability, has a turnover of up to £100,000 and has been in business for over 5 years from an MK postcode. However, when we added employer’s liability insurance for one employee, the cost rose to £239.86 a year. Prices correct at October 2017. CMTIA is one of the largest providers of market traders liability insurance. Public and products liability can be obtained from £57 a year and has a £5m limit of indemnity. This does not include liability cover for products exported to the USA or Canada. Employer’s liability is an optional extra and starts from £34 per year. At Stallholders.org you can obtain public liability insurance for £5m. You can get a 1 day membership for £18.50 or an annual membership for £59.50. You can add up to 5 people to this policy at a cost of £15.50 per individual. "I have had pet insurance with other companies for many years, this is the first company that has dealt with a claim so efficiently and wi..."